Jimmy Quiroga (R) Designs is known for the ability to please every client, which inevitably become our friends. Jimmy is a 3rd generation award-winning master jeweler, but more than that he is a trustworthy partner, helping you acquire pieces you or your clients have only dreamed about. Even better, since we are the designers and manufacturers, you will pay true wholesale price, guaranteed. Your pieces can be designed and created especially for you or your client, or we can re-design old jewelry into something fresh and new. We help make memories of a lifetime, and we are here to help you find the greatest pleasure, satisfaction and delight in your jewelry. We also give priority to giving back to our community in the form of multiple sponsorships and fundraisers. A big fan of our work calls it "Passion and Compassion". Jimmy Quiroga's grandparents founded the first jewelry store next to their hotel in Galicia, Spain in the 1890's. 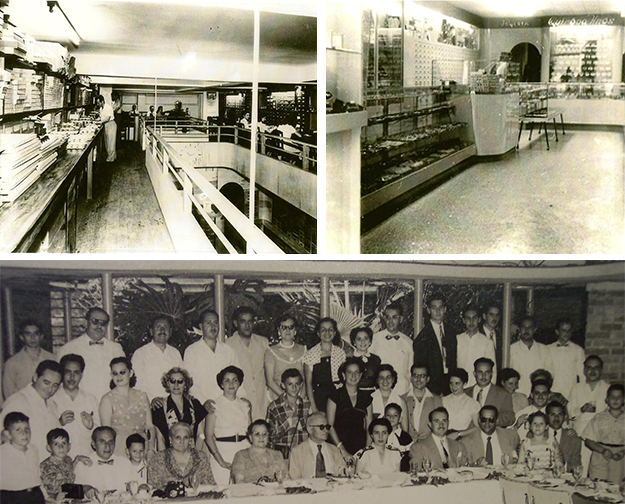 The family expanded to beautiful Havana, Cuba in 1923, while always maintaining their home in Spain. Their wholesale jewelry business was established in Cuba shortly afterwards as QUIROGA HERMANOS in the heart of Old Havana, and the family manufactured jewelry in Spain and Germany. Eventually the business passed on to Jimmy's father, Manuel, and evolved to become a premier manufacturer and distributor of fine jewelry in the country. In 1959 the Communist regime rose to power and confiscated all private businesses, including QUIROGA HERMANOS. Jimmy's grandparents returned to Spain, and in 1960, when Jimmy was 6 months old, Jimmy's parents relocated to Miami, Florida, leaving everything behind. They rebuilt the business from the ground up under the name of Lido Jewelry, Inc., believing that the name Quiroga was too difficult for North Americans to pronounce. Since he was a child, Jimmy took an interest in the business, sketching designs which were later brought to life. He spent his Summers at his grandfather's home in Spain and traveled throughout Europe. It was there that his love of jewelry culminated, being exposed to the great museums and galleries, from traditional to contemporary. Upon graduation from St. Thomas of Villanova University with a degree in marketing, he joined the family business. He married his college sweetheart Vivian Pazos Quiroga, a corporate attorney and fine art investment consultant. She is also his muse and biggest fan, and has joined him as CEO of the company. Together they travel and work, seeking inspiration in the cultures, textures, and colors they come across. Other inspiration comes from their mutual love of Latin American fine art. The outcome of these experiences and his endless creative drive is the JIMMY QUIROGA ® DESIGNS Fine Fashion Jewelry Line and the custom made JIMMY QUIROGA ® DESIGNS Couture Fine Jewelry Line. A variety of diamonds, precious and semi-precious gemstones are used, including a wide selection of cultured south sea and freshwater pearls, set in sterling silver, gold or platinum. The company has deep concerns for the environment and has a goal of making beautiful pieces that enhance people's lives while, at the same time, leaving our planet more sustainable than it was. The designs are created using primarily reclaimed metals and stones. JIMMY QUIROGA ® DESIGNS has received recognition and awards for its quality and creativity from DIET COKE Silver Anniversary, INSTYLE MAGAZINE Miami Designer, MIAMI FASHION WEEK Jewerly Designer, the Miami-Dade County Mayor's office, the City of Miami Beach Mayor's office, the South Florida Hispanic Chamber of Commerce, GLADYS MAGAZINE numerous covers, the MIAMI HERALD NEWSPAPER Tropical Life Section cover, Florida Heart Research Foundation Award, DiversityBusiness.com as one of the "Top 500 Emerging Businesses in the U.S." among others. JIMMY QUIROGA ® DESIGNS enjoys partnerships with national retailers including MACY'S, BLOOMINGDALE'S, SEARS.COM, BJ's.COM, SKYMALL.COM, ZULILY.COM and also fine jewelry stores in the US and the Caribbean. Our company is also known for generosity. Anyone who is familiar with its owners, Jimmy & Vivian Quiroga, will attest to their priority of helping the community, in the form of donations and partnerships with a long list of charities and foundations. Among the fundraisers supported are: Amigos Together for Kids, Alonzo Mourning Foundation and Overtown Youth Center, American Cancer Society, American Red Cross, Best Buddies International Foundation, Big Brothers Big Sisters, Children’s Cancer Fund, Cuban American National Council, Dwayne "The Rock" Johnson Foundation, Fairchild Tropical Botanical Gardens, Florida Heart Research Foundation, Florida Grand Opera, Jackson Memorial Hospital Foundation, Frances McGlannan School for Learning Difficulties, Guardian Angels of Holtz Children’s Hospital, League Against Cancer, Immaculata-a Salle High School, Mercy Hospital Foundation, Miami Children’s Hospital Foundation, Miami Lighthouse for the Blind and Visually Impaired, Roy and Leah Black Consequences Charity, St. Patrick Catholic Church and School, St Thomas of Villanova University, Tracy Mourning’s Honey Shine Mentoring Program, Univ. of Miami ALS Research Center, Vizcaya Museum and Gardens Preservation League, among others. Celebrities continue to add JIMMY QUIROGA® DESIGNS pieces to their collections, including music legends Gloria & Emilio Estefan, Phil Collins and his wife Orianne, Latin music star Thalia, Academy Award nominated actor Andy Garcia and his wife Marivi, Beyonce, Shannon Doherty, Giuliana Rancic, Dwayne Johnson, NBA star Alonzo Mourning and his wife Tracy, NBA star Dywane Wade and wife actress Gabrielle Union, Global designer Carolina Herrera, Real Housewives of Miami Ana Quincoces, Leah Black and Christy Rice, NFL legendary Coach Don Shula and his wife Mary Anne, TV personaity Lily Estefan, Quincy Jones, Ricky Martin, Hip Hop music star Flo Rida, philanthropists Adrianne Arsht, Swanee DiMare, Bunny Bastian, Lynn Arison and Lilliam Machado, political talk show host Maria Elvira Salazar, First Lady Barbara Bush, First Lady Michelle Obama, Her Royal Highness Maria Teresa Grand Duchess of Luxembourg, First Lady of Panama Marta Linares de Martinelli, First Lady of Honduras Rosa Elena Bonilla de Lobo, Latin singing sensation Natalia Jimenez, Two time Superbowl Champion William Roberts, 2016 Olympic Gold Medalist Monica Puig, 2016 World Champion Formula 3 race car driver Gustavo Menezes and 2016 Olympic Track and Field Gold Medalist Armand Hall. The pieces have been showcased on national television broadcasts such as NBC Morning show "Today in South Florida", "Maria Elvira Live" on ABC, worn by news anchors on ABC, CBS, NBC, the Spanish Broadcasting System, Univision, Mega TV and other National News Broadcasts. Jimmy and Vivian Quiroga live in Miami Beach, Florida, and have two sons, Jason and Kevin. Together they have achieved a balance of the demands of family and work with grace and lots of love. Because they have received so much from their loyal clients, community and friends, they give back generously at various events throughout the year. Please see the News blog and Gallery sections of this web site. Through beautiful and affordable jewelry we strive to help our community and to bring happiness to others.